Life on Earth has its challenges but what about life on Mars? Can humans ever survive on our neighbouring red planet, fourth from the sun? To help answer that, an international crew of six people spent a year living inside a solar-powered dome on the slopes of Hawaii’s Mauna Loa volcano. The place is starkly red-brown, dramatically rocky, barren of plant life – a lot like Mars. 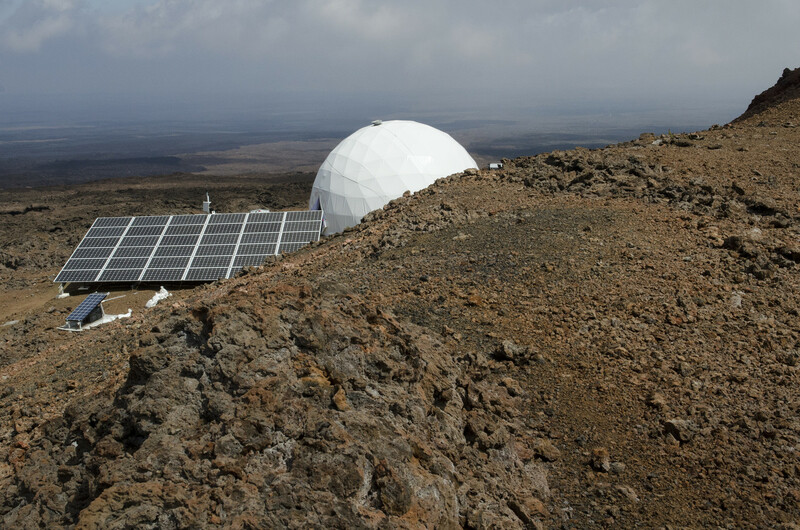 It was the latest Earth-bound project from the HawaiI Space Exploration Analogue and Simulation ( HI-SEAS ), a NASA-funded trial of technologies, systems and people for its future Mars mission. The crew – an astrobiologist, a doctor/journalist, a soil scientist, an engineer, a physicist and a habitat specialist – emerged from the dome , pale but triumphant from their mission during which they played out an elaborate and realistic game of planetary exploration. The crew spent most of their mission time working, playing and sleeping inside the 11-metre dome, all the while performing experiments, and having experiments performed on them. They could leave the dome, but only in mock-up spacesuits, and never alone. They could communicate with the world by email and blogs, but the 20-minute delay imposed to represent the radio signal time delay across interplanetary distances made real-time conversation impossible. They ate only canned or freeze-dried food, though they were able to supplement this with fermentation to make such delicacies as bread and cream cheese. They were allowed a total of eight minutes in the shower per week. The dome is located in an isolated place that just looks like Mars. This has not been the only, or even the longest, Mars mission simulation. HI-SEAS itself has conducted three shorter missions before. Meanwhile in 2010, an international crew in Moscow stayed in the Mars 500 simulation for 520 days. Various chapters of the Mars Society conduct such events every year now. I did a short simulation at the Mars Desert Research Station , Utah, in 2003. It was a fantastic experience – a great bunch of people with a common purpose, working hard, playing hard and learning fast. At times, it was easily possible to believe you were really on Mars. In September, Australians Jon Clarke and Annalea Beattie will join a 160-day simulation at habitats in Utah and northern Canada. The rationale is simple: to prepare for anything complicated, difficult or dangerous, you need to practise in conditions as close as possible to the real thing. It’s why soldiers conduct war games, Olympic swimmers do endless laps in suitably sized pools and airline pilots spend hours rehearsing difficult landings in flight simulators. We learn by doing, and when we cannot afford to get it wrong, we approximate in realistic pretences beforehand. In these mock events, we can try out new ideas, because failure is not so consequential. In HI-SEAS mission 4 , the research was focused on human factors questions, in particular: how will a team of six people, more isolated than any in history, living in close proximity and carrying out difficult technical tasks, perform over time? Some red flags had been noted in earlier missions. Russian crews on the MIR space station had sometimes become withdrawn and uncommunicative, even ceasing work altogether. Ground simulations had warned of the potential for serious cultural clashes among international crews, specifically around food and interpersonal etiquette. For a space team, where the cooperation of every member is critical, such disharmony could be disastrous. Crews had also experienced a third-quarter effect, in which morale – and performance – dipped low at the 75% mark. The mission 4 crew, forewarned about these problems, experimented with solutions. The full results are not written up yet, but much can be seen in the crew blogs . To overcome depression and withdrawal, and cement crew solidarity, the crew danced together , learnt new skills together (notably, to speak Russian ) and took turns creating semi-gourmet meals out of the limited rations. To prepare themselves for an unexpected crises, they practised getting by on reduced water rations . Later, when a water delivery failed to arrive on schedule, they were forced to draw on an old water tank that they feared had been contaminated. They used their rationing experience to calculate their minimum requirements, which in turn let them improvise an evaporative purification system that supplied enough water for the six to survive until they could be resupplied. Mark Watney, from the original novel and following movie The Martian, would have been proud. Still, critics complain and ask, what’s the point of exploring Mars, anyway? We have pretty good pictures and science data already. Why spend huge amounts of money on such a venture? Shouldn’t we wait until we’ve solved some of the really pressing problems that face us on Earth, the old argument goes, before sending astronauts galloping off to another planet? Considering the endless capacity of humans to create problems for themselves, what this argument really amounts to is this: we should never go. But there are very good reasons for learning how people can travel, live, work and play beyond the Earth. This is not a pipe dream, it’s a socioeconomic necessity. History shows the continuous and ongoing expansion of healthy human societies into new environments. Staying put is not what humans tend to do, especially when resources and opportunities are limited. Increasingly, as the population (and our appetite for material things) grows, this puts us into conflict with others. It’s already a limiting factor on much of what happens in human development, and is likely to be even more so in future. If we take a long view, the importance of being able to move out into the solar system in search of food, water, energy and mineral resources becomes clear. To suppress an expansion away from our point of origin, or unduly delay it, is to put unbearable constraints on human life in the future, and increase the risk of ever escalating territorial disputes, closed boarders, hoarding and warfare. In Europe, 250 years ago, there was a red, dusty, alien environment out there on the frontier. Hostile, unknown, dangerous. Six months away on a ship, if you survived at all. How could you live there? Why would you go at all? What would you do there? That was Australia. Now look at us. Can anything that those early explorers did compare in importance to us with the fact that they decided to go there and set up a colony? A Mars colony would be a truly wonderful thing. A whole new branch of humanity, with its own customs, laws, science, business, music, art, dance and literature. It would be an inspiration even to those who would never go. It would make some good headlines, for a change. It would be giving something positive to the future, instead of always robbing it.